Arguably one of the gaming industry's most famous characters comes from a game about surviving with blocks. He’s mean, he’s green, he’s got an explosive personality. Minecraft’s creepers are nothing to mess with. the original creeper was originally brought into Minecraft on August 31, 2009. Accidentally altering the length and height of a pig, he reversed their numbers. The pig was skinny and tall vs. Short and fat. He was grey and didn’t have a name. Notch liked the flaw so much he decided to implement it into the game and create a new hostile mob. the creeper was given life with a shade of green and a scary face to make players shake in fear! Creepers are aggressive by nature and will actively spawn more at night (Or in an area with light levels less than 8). They will roam around in the day and if they get close enough to you, they’ll gladly explode and attempt to take you with them as they end their life. If a creeper is struck by lightning, they will become a charged creeper. Notch has stated that he likes to think that creepers would feel “crunchy, like dry leaves”, and that he likes to imagine that creepers would be made of leaves or similar. He’s not quite sure why they explode, however. 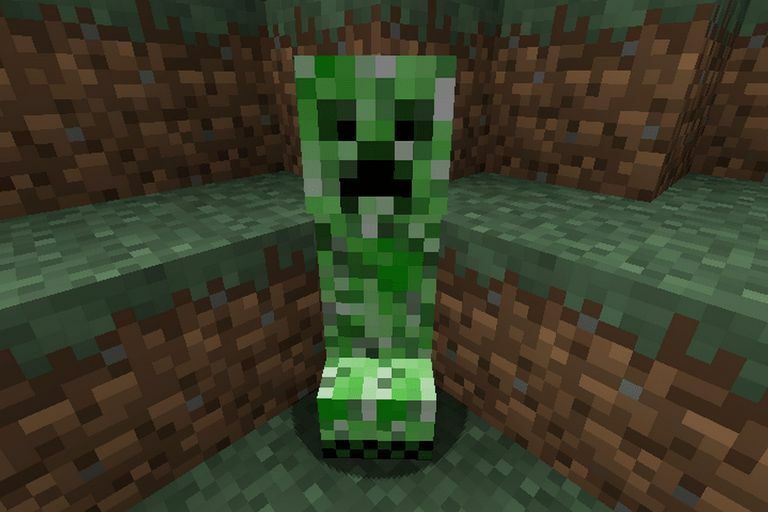 When a creeper is within a block of a player, the creeper will create a hissing noise and will begin to explode. If you unexpectedly hear a creeper’s hiss, your best bet is to get out of the area immediately as he will deal a high amount of damage if the hit is direct. If you are wanting a creeper to explode for whatever reason, use a flint and steel on the mob and it will immediately force the process. If a creeper is stuck in a cobweb, it will take them longer to explode. there are many ways to kill a creeper, some ways more beneficial than others. When a creeper is killed, they have a chance of dropping anywhere from 0-2 gunpowder. If a creeper is killed by a charged creeper, the creeper killed by the blast will drop a creeper head. If a skeleton kills a creeper with an arrow, the creeper will drop a music disc. If you want to kill a creeper quickly, your best bet is to get as many critical hits on them as you can. Either do it in head-to-head combat with a sword and jump back after hitting him directly or do it afar with a bow and arrow. Both ways are great in terms of dealing with these ferocious mobs, but if you don’t deal with the problem correctly, you may have a hole in the ground! Something that has been tested many times is how much armor is actually needed to withstand a direct hit from a creeper point-blank. If you were on the difficulty ‘hard’ and were attacked with a point-blank explosion from a creeper wearing full iron armor, you would have lost 19 of your 20 health points (Half a heart). Charged creepers are a much more dangerous mob to mess with. Charged creepers will create an explosion twice as large and deal much more damage to the player when hit. Your best bet to kill a charged creeper is at range with a bow and arrow. Creepers don’t seem like they would be too afraid of much, but surprisingly they’re afraid of tamed cats and ocelots! If a creeper is within a certain range of said animals, they will run away from them (Around 30 blocks). A tip to survival is to definitely have a cat with you if you are going into creeper heavy territory. Creepers are not a force to be messed with unless you’re ready. Make sure if you’re going to go up against one of these beasts, be prepared and definitely do not hold back. Creepers are very dangerous, but let’s face it, they’re just a bunch of scaredy-cats!